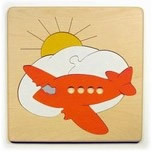 Puzzle People have been making wooden puzzles since 1972. 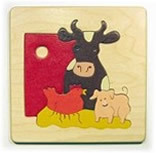 Located in Northern California, the Puzzle People use baby safe materials and finishes on all puzzles. We are known for high quality educational wooden map puzzles and a variety of personalized name puzzles, as well as for award winning puzzles of endangered animals. During the months of November and December, please allow us up to 4 weeks to make your puzzle. Please use the “comments” section to include your special requirements - INCLUDING GIFT CARD MESSAGES.